Laboratories and offices of the Biophysical Chemistry group are located in two buildings of the central campus of the TU Berlin. 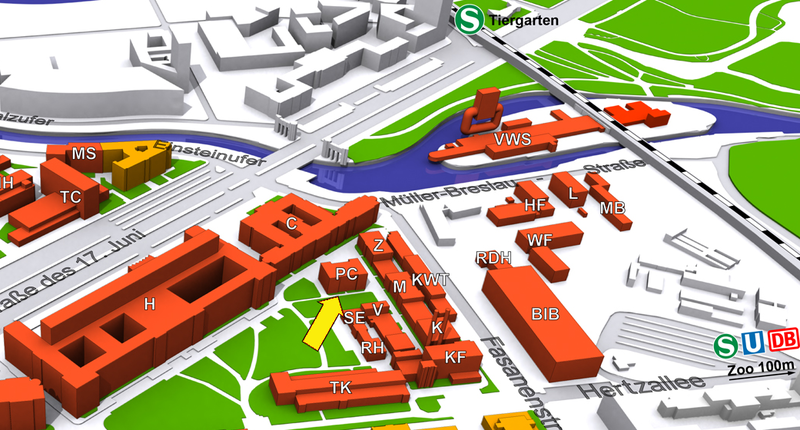 The contact address refers to the PC building (Max-Volmer Laboratory, yellow arrow) which accommodates the offices of the group members and the biological and biochemical laboratories, set-ups for UV-vis and fluorescence spectroscopy as well as internal workshop facilities. The vibrational and EPR spectroscopic laboratories and a chemical lab are located in the TC building.